With it's proven track record in handling everything from CAD Incidents to UCR and CLERY Reporting, Investigations, NFIRS, Fleet Management, Equipment.....and the list goes on and on, End2End continues to lead the way as the #1 Information Management Solution for Police, Public Safety, Parking, Security and Fire Departments all of sizes. End2End, Inc. has provided many years of building, enhancing, and supporting applications for its clients, and with a focus on the future, End2End has the longevity to sustain its #1 position for many decades to come. Solutions are available in a Microsoft .NET platform, utilizing the power and scalability of Microsoft SQL Server. Long gone are the days of difficult systems.... Now it's time to feel the power of an End2End Enterprise Solution. Find out what it's like to have the power of Data-On-Demand with End2End Solutions! 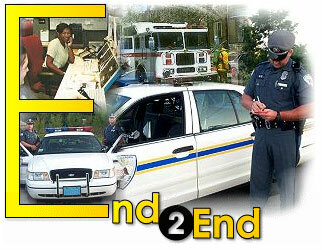 Contact us today for an online Demo of the latest and greatest from End2End, Inc! To Top 2010 End2End Inc. All rights reserved.